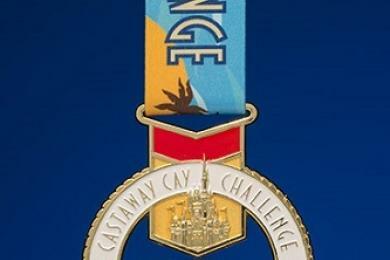 POSTED: Thu, 10/09/2014 - 05:00 | POSTED BY: Traci C.
The first-ever runDisney Castaway Cay Challenge takes place in January after the Walt Disney World Marathon Weekend, and Disney recently offered a sneak peek of the finisher medal. The medal features the Disney Cruise Line logo and an image of a Disney Cruise Line ship in addition to Cinderella Castle. Runners participating in the Challenge will first run their events during the Walt Disney World Marathon Weekend, and then will run the Castaway Cay 5K. The 5K takes place during a stop at Castaway Cay on a four-night cruise aboard the Disney Dream. Guests on this cruise will also have a chance to enjoy runDisney activities onboard, featured menu items, guest speakers, and special merchandise. 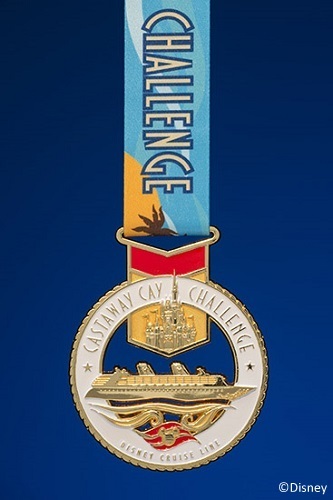 Runners who are registered for an event during the 2015 Disney Princess Half Marathon in February also have a chance to earn a Castaway Cay Challenge Medal. The four-night cruise following the Princess Half Marathon departs February 23 on the Disney Dream. For more information on the Castaway Cay Challenge after the Princess Half Marathon weekend visit runDisney.com. Ooooo that's a pretty one.